This chapter explores how advertisements represent sustainability. It initially provides discussion of the contemporary advertising industry and its role in promotional culture and it also considers the textuality of advertisements and their communicative power. The chapter also discusses the features of green advertising and the practice of greenwashing. An analysis of Aotearoa New Zealand energy television advertisements shows how humour and celebrity are used to offer a positive and easily attainable portrayal of sustainability. 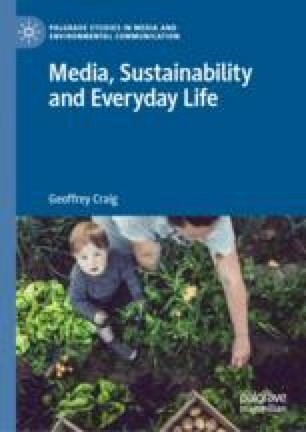 Alternatively, the second case study analysis of Australian household sustainability magazine advertisements reveals how the technical and scientific features of sustainability are foregrounded. Fahy, Ben. 2015. “Puns of Steel: Wells Gets His Kit Off in Latest Meridian Promotion.” Stop Press NZ: Marketing, Advertising & Media Intelligence, May 4. http://stoppress.co.nz/news/puns-steel-wells-gets-his-kit-latest-meridian-promotion. Makower, Joel. 2010. “Is TerraChoice Greenwashing?” GreenBiz, November 1. https://www.greenbiz.com/blog/2010/11/01/terrachoice-greenwashing. New Zealand Heads. 2016. “New Zealand Heads Towards 90% Renewable Generation.” Scoop, August 9. http://www.scoop.co.nz/stories/BU1608/S00257/new-zealand-heads-towards-90-renewable-generation.htm. Record First Half. 2016. “Record First Half Keeps UK Adspend Resilient.” http://adassoc.org.uk/news/record-first-half-keeps-uk-adspend-resilient/. US Advertising Industry. 2017. “U.S. Advertising Industry—Statistics & Facts.” https://www.statista.com/topics/979/advertising-in-the-us/.